Western Blot: RhoA Antibody (1A11-4G10) [NBP2-22528] - Analysis of 25 ug of various whole cell lysates or 0.5 ug of purified protein (full-length His-RhoA, truncated GST-RhoB or full-length GST-RhoC fusion) per well onto a 4-20% Tris-HCl polyacrylamide gel. 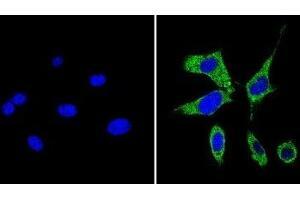 Immunocytochemistry/Immunofluorescence: RhoA Antibody (1A11-4G10) [NBP2-22528] - Analysis of Rho A/B/C (green) showing staining in the in the cytoplasm of A431 cells (right) compared to a negative control without primary antibody (left). 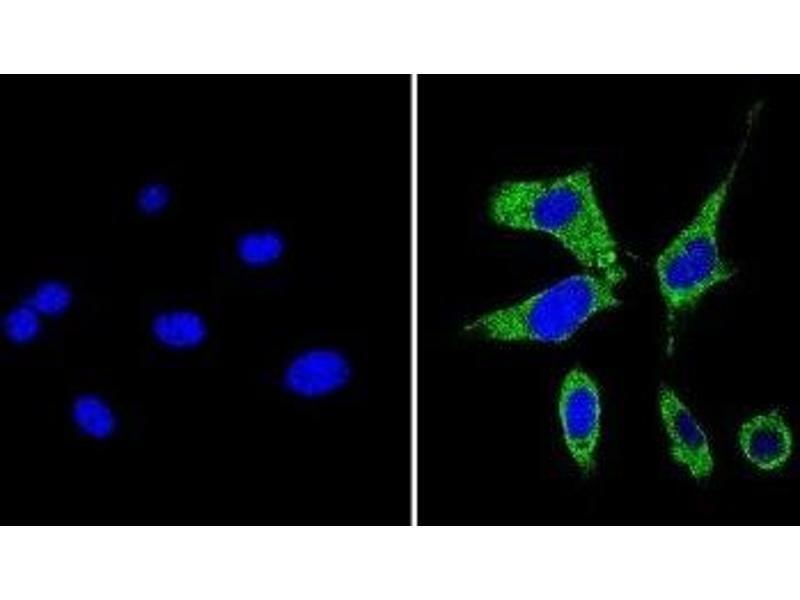 Immunocytochemistry/Immunofluorescence: RhoA Antibody (1A11-4G10) [NBP2-22528] - Analysis of Rho A/B/C (green) showing staining in the in the cytoplasm of NIH-3T3 cells (right) compared to a negative control without primary antibody (left). 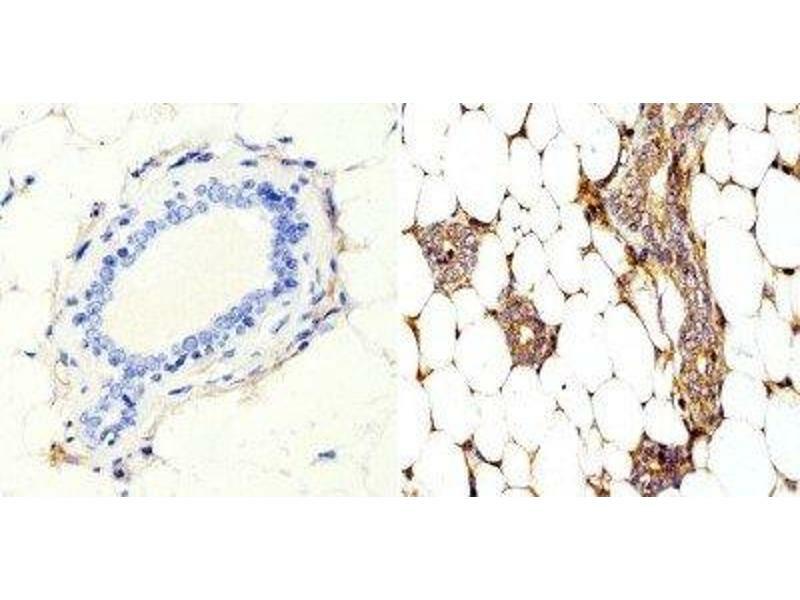 Immunohistochemistry-Paraffin: RhoA Antibody (1A11-4G10) [NBP2-22528] - Analysis of showing staining in the cytoplasm of mouse breast tissue (right) compared with a negative control without primary antibody (left). 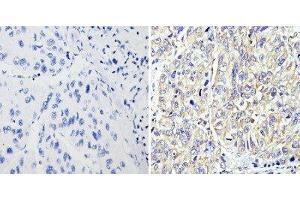 Immunohistochemistry-Paraffin: RhoA Antibody (1A11-4G10) [NBP2-22528] - Analysis showing staining in the cytoplasm of human hepatocarcinoma (right) compared with a negative control without primary antibody (left). 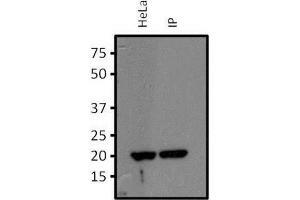 Immunoprecipitation: RhoA Antibody (1A11-4G10) [NBP2-22528] - Analysis of RhoA/B/C was performed on HeLa cells. 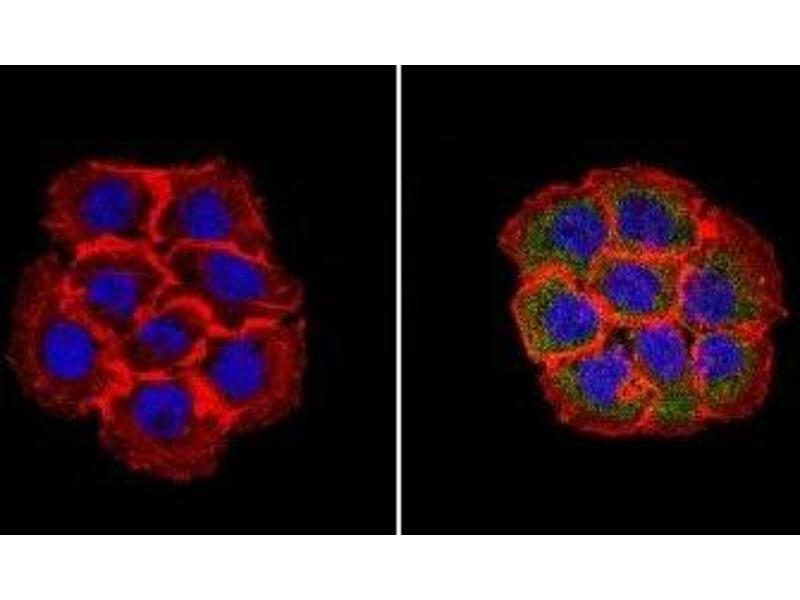 Antigen-antibody complexes were formed by incubating 750 ug of HeLa cell lysate with 2 ug of a RhoA/B/C monoclonal antibody overnight on a rocking platform at 4C. 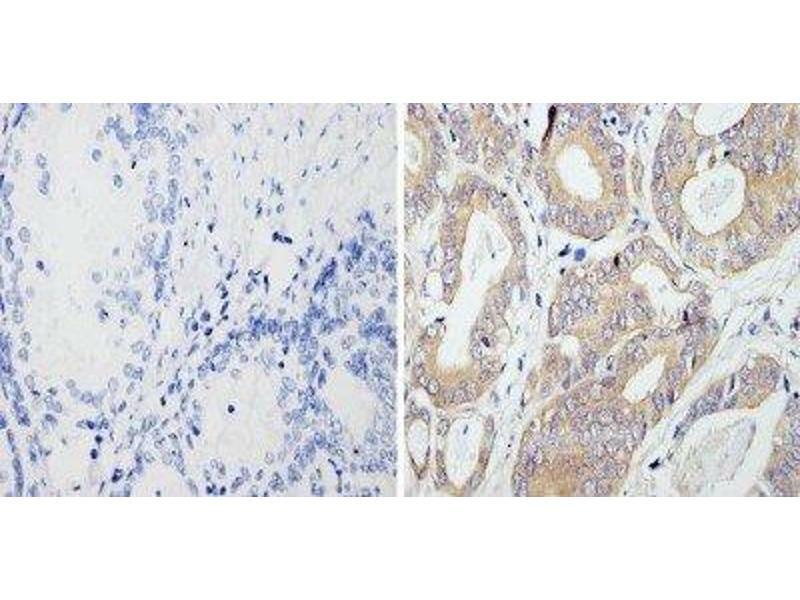 The immune complexes were captured on 50 ul Protein A/G Plus Agarose, washed extensively, and eluted with 5X Lane Marker Reducing Sample Buffer. 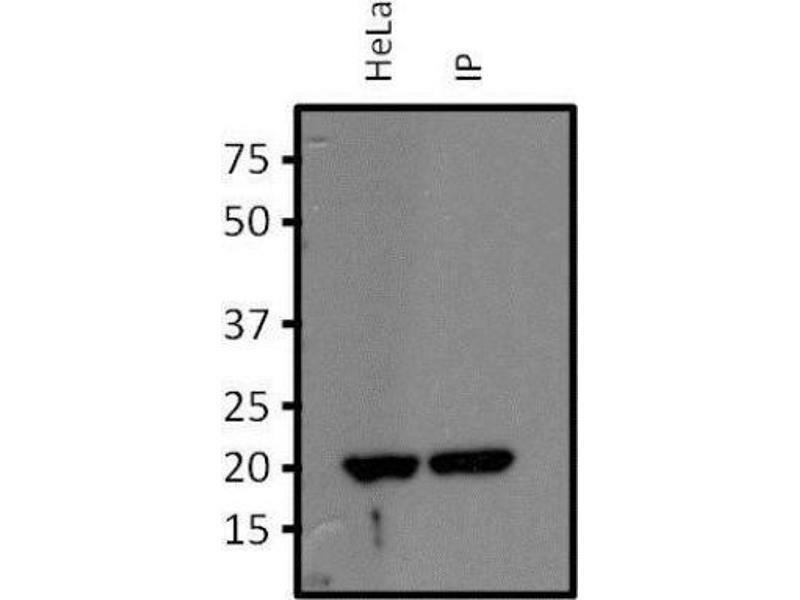 Eluted sample (right lane) and 25 ug of HeLa cell lysate (left lane) were resolved on a 4-20% Tris-HCl polyacrylamide gel, transferred to a PVDF membrane, and blocked with 5% BSA/TBS-0.1%Tween for at least 1 hour. 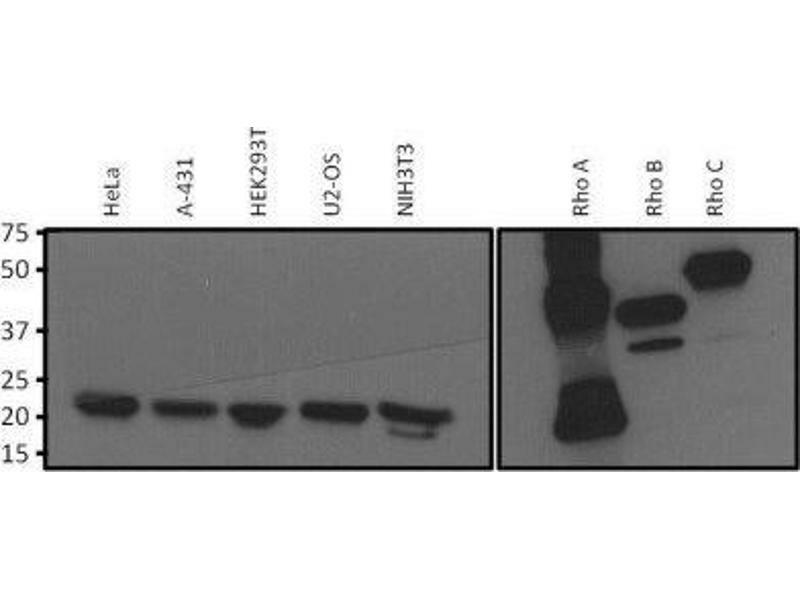 The membrane was probed with a Rho A/B/C monoclonal antibody at a dilution of 1:1000 overnight rotating at 4C, washed in TBST, and probed with Clean-blot IP Detection Reagent at a dilution of 1:2500 for at least 1 hour. 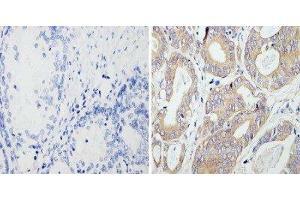 Immunohistochemistry-Paraffin: RhoA Antibody (1A11-4G10) [NBP2-22528] - Analysis showing staining in the cytoplasm of human prostate carcinoma (right) compared with a negative control without primary antibody (left). 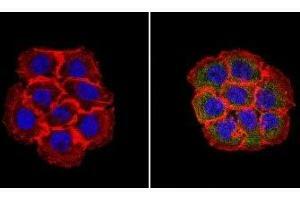 Immunocytochemistry/Immunofluorescence: RhoA Antibody (1A11-4G10) [NBP2-22528] - Analysis of RhoA/B/C (green) in NIH3T3 cells. 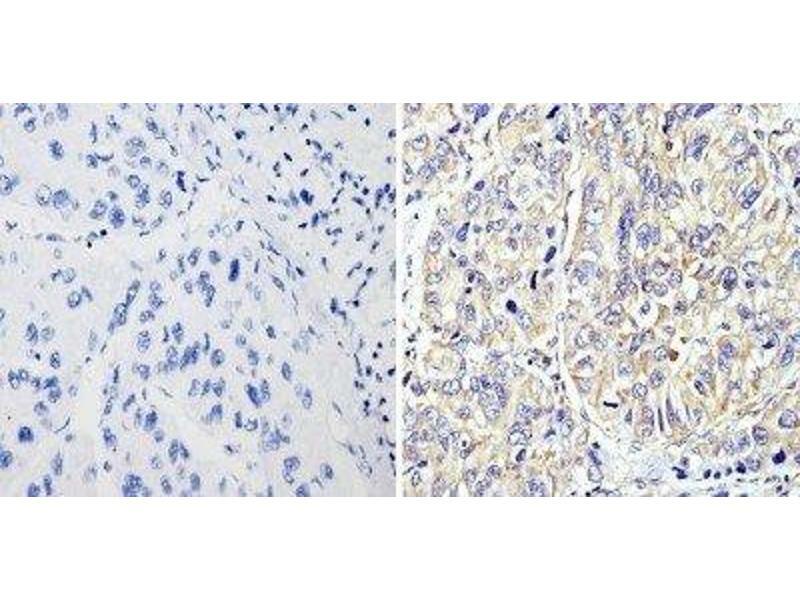 Formalin fixed cells were permeabilized with 0.1% Triton X-100 in TBS for 10 minutes at room temperature and blocked with 1% BSA/TBST for 15 minutes at room temperature. 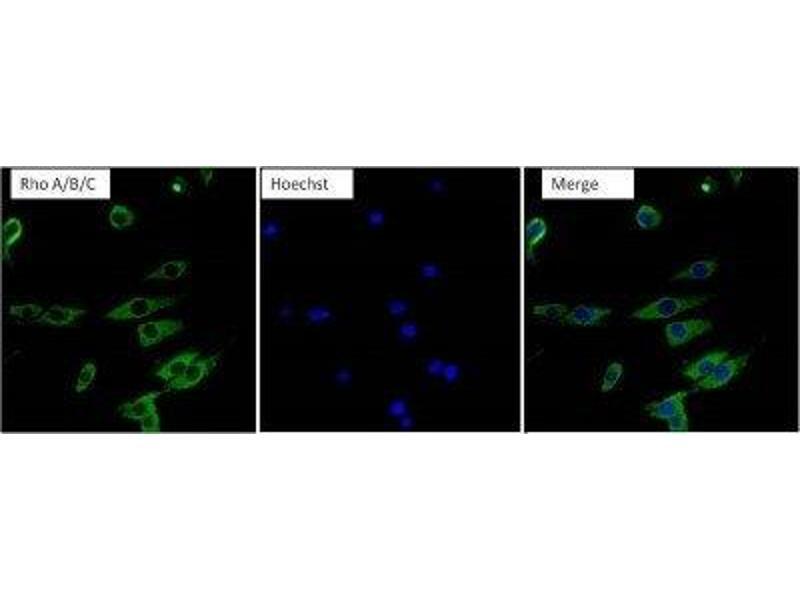 Cells were probed with a RhoA/B/C monoclonal antibody at a dilution of 1:100 for at least 1 hour at room temperature, washed with PBS, and incubated with DyLight 488-conjugated goat-anti-mouse IgG secondary antibody at a dilution of 1:400 for 30 minutes at room temperature. 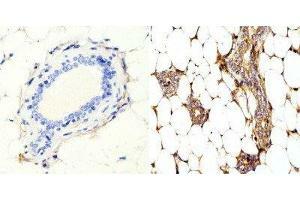 Nuclei (blue) were stained with Hoechst 33342 dye.